I’m in love with that wreath! I love it! So much better than the measley pinecones and cinnamon sticks on my front door. I’m bookmarking this for next year. holy crap. that wreath! I am speechless. LOVE! Apparently I am also a gnome/toadstool freak! awesome. I’ve been a toadstool freak since falling in love with the children’s book I Am a Bunny. Go look at that cover, go on. The people you love probably love you for your adventuresome spirit, right? You’ll have to let us know how that biscotti comes out. What an awesome wreath! Just perfect. Ack, the wreath is so amazing!! I love it and want one of my own immediately! I can’t wait to show this to my friend Marianne. She was on While You were Out and they stole her garden gnome and took it on a little adventure. I made the parmesan black pepper biscotti last year and they were fantastic. You won’t be disappointed. the wreath is adorable!!!! gnomes rule! i love trying new recipes every year – I usually do about 10 different kinds of cookies and try to do about half of new recipes! it’s a fun adventure! 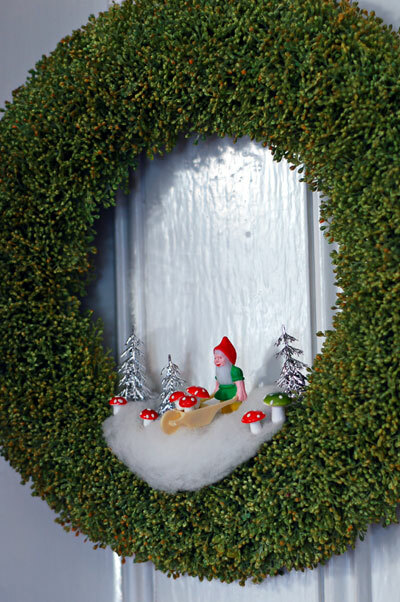 Fabulous wreath! I will have to do a wreath next year because the lovely, tasteful arrangement of greens, dried hydrangea, ilex, in a large urn outside the house is now buried completely from the plowing of the driveway. :( Wreath on door is a MUCH better ploy. Let us know how the Pepper Parmesan Biscotti turn out. I bake Pepper-Hazelnut Biscotti for friends–they are a really great adult cookie and taste wonderful dunked in just about anything. Cute cute cute! Yay for gnomes:) Happy Holidays! I have this gardener gnome in a bigger edition, he lives in my herb garden. It’s an heirloom from my husbands granny and now looks very worn from being outside all year. I love him dearly. The wreath is adorable! So cute, and so creative. One time at Thanksgiving I made some homemade marshmallows for the top of my sweet potatoes and I have to tell you, they were really much better than the bought kind. Not only that, but now I am quite famous in my family for this. I am endlessly teased about it. But if you think about it, people that knit like we do don’t typically take the easy way out anyway. We like the homemade and handmade and craftiness of cooking and knitting socks that you could otherwise buy and all that. Bravo to you and all of us for this. Evil! How dare you post more things about which I can obsess!?!?!? And now you have me wanting hot chocolate with vanilla sugar. More gnome/mushroom freaks out there? Ohhhhh, yes. Yes, indeedy. What a great idea. In fact, I think I can bust this kind of wreath out next year starting right after Halloween! 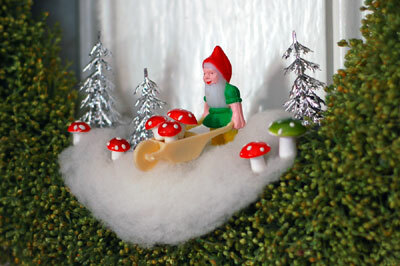 There’s only twelve days of Christmas, but Gnomushroomalia lasts a *looooooong* time. ah that is cute and kitsch. tomter, nisser, gnomes, leprechaurns, elves. they are great. thanks for your inspiration this year. i can tell how much you love the thing from what you come up with. i wish sometimes i could smell and touch too, so my new year’s resolution will be to buy some wool from you. although i am afraid it can be as difficult as losing weight or smoking but maybe also as addictive as those too. Merry Christmas to you and Mr. and your sweet pup! so very amazing, thanks for the links too! I need to get some of those mushrooms…hope you had a grand holiday!